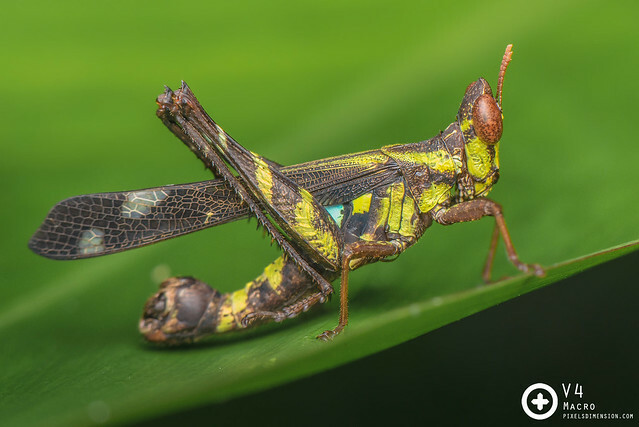 Members of the Order Orthoptera are diverse, including those commonly known as grasshoppers, crickets, katydids and locusts; many of which are capable of flying and are thus widely distributed throughout the world. 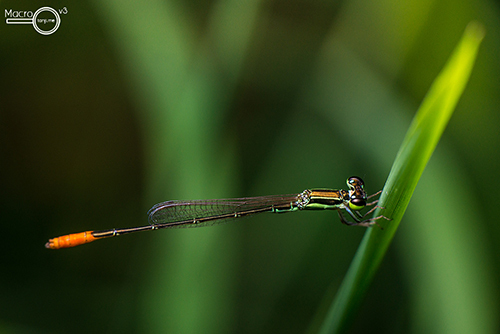 These insects rely heavily on sound and vibration to locate individuals, particularly for mating. 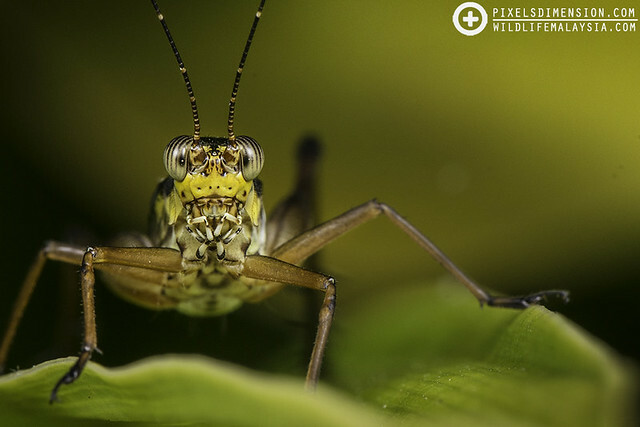 Some of the characteristics of Orthopterans include a long and strong hindlegs (for jumping), large compound eyes, mandibulate mouthparts (for chewing), wings and stridulation organs (which produce sound). Orthopteroid species undergo incomplete metamorphosis and consist of three stages- eggs, nymphs and adults. #1. 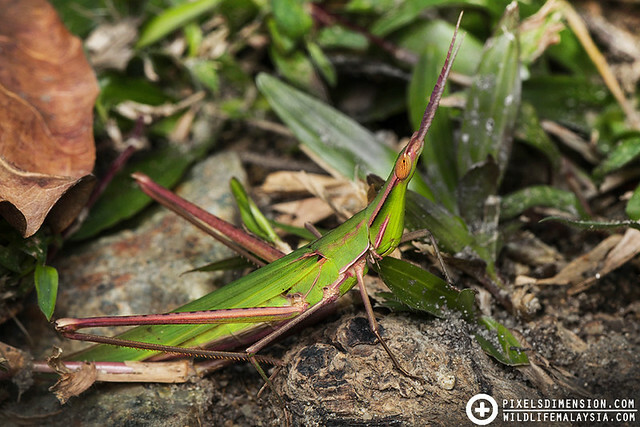 A Monkey Grasshopper (Erianthus cf. versicolor). This grasshopper of the family Eumastacidae is amongst the most primitive Orthopterans, and can be easily recognized by its protruding head and wings. #2. A freshly moulted grasshopper. A beautiful, freshly moulted grasshopper. Note the shedded skin (called exuvia) on the upper right. 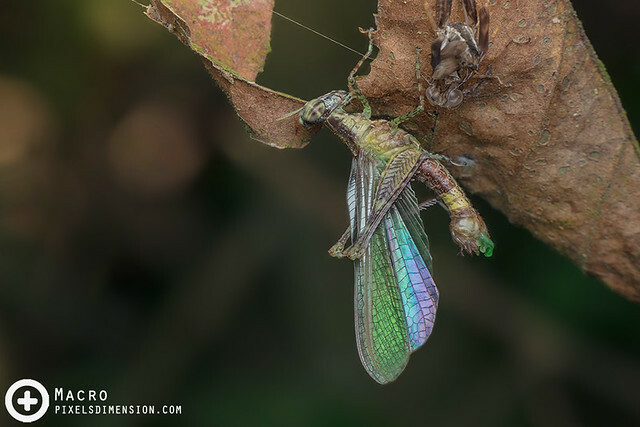 Many insects shed their skin in a process called ecdysis in order to grow up. This is because unlike us, they have hard exoskeletons that restrict further growth, and thus have to be “renewed” in order to grow larger. 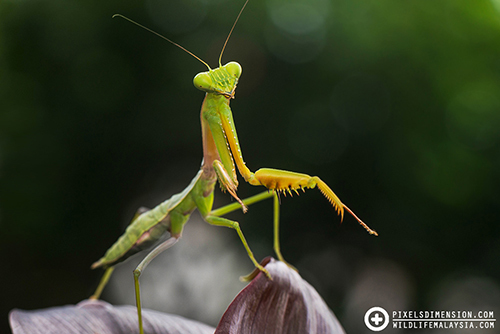 After ecdysis, insects that emerge are often most vulnerable to harm due to the new exoskeletons which are still soft. Winged insects cannot fly right after moulting as well, pretty much the only reason why I managed to get this shot! #3. A greenish-pink Slantfaced Grasshopper (Acrididae). Not all grasshoppers look like the ones we usually see. Some have long, slanted faces; and that’s how these particular group of grasshoppers got their names. 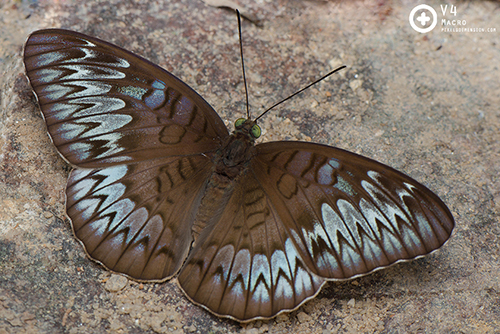 These medium-sized insects are highly sensitive and prefer living in bushes and undergrowths. #4. A mating pair of grasshoppers. 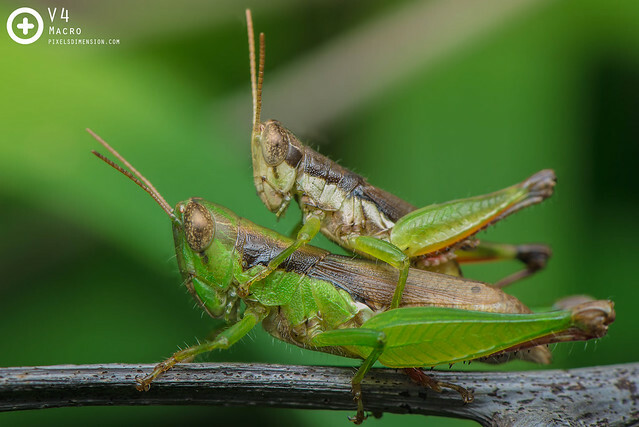 Grasshopper pairs rely on sound, sight and even scent to identify one another. 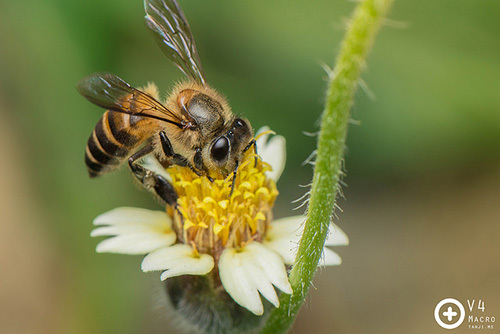 During copulation, the male will light on the back of a female, and then transfer sperm using its reproductive appendage. The male will often mate with the same partner for multiple times to ensure reproductive success. #5. Common Bush Cricket (Nisitrus sp. ♀). An upclose, face shot of a Common Bush Cricket, showing its large, rounded eyes and mouthparts (mandible, maxilla, labium). 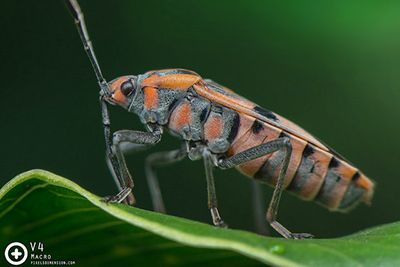 These moderately large and colourful crickets can be found in forest parks and gardens, chewing away on leaves of many plants.